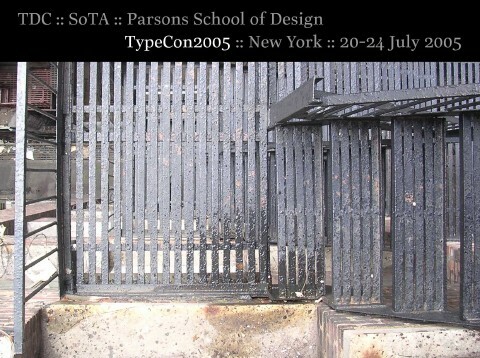 These are images from TypeCon 2004, in San Francisco sponsored by SoTA. They've all been reduced to a standard 432x324 pixel size. If you'd like larger, higher-resolution files of one special image, contact me. Due to the sheer number of images, they are not set into HTML pages, so have no navigation in the pages to return to this listing; use the Back feature of your browser instead. How did the camera do this? Linotype Winners: Roberto, Ralf, ? The Sooys decided to eat at the bar across from the party, as did I (and smoked a ciggie INSIDE the bar OOOOOH how EEEvil). Joachim's band's singer's shoes help reach those high notes. The hotel area, in a model; couldn't get out to the roof. For those who missed the deliberately brief announcement. Sorry again that the shots are not steadier; IANAP, for good reason.